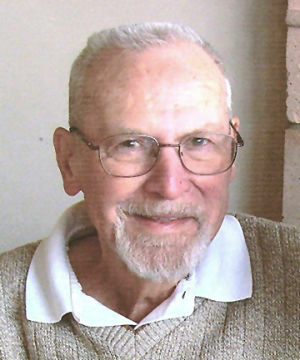 Raymond William Marshall of Cherry Valley went home to be with the Lord January 20, 2014. He was born Dec. 1, 1932 in Montebello, Calif., the only child of Robert and Verda Marshall. He grew up in El Monte, where he formed life-long friendships with Joe Smith, Sr., Kay Castro, Vance Rowland and Joe Hamm. After graduating from El Monte High School in 1951, Ray joined the Navy and served aboard USS Skagit. It was while on leave in northern California that he met his future wife, Patricia, in Santa Cruz. As she tells the story, a friend of hers brought Ray to a party one evening. She opened the door to greet a cute blonde sailor. They soon engaged and recently celebrated their 60th wedding anniversary. After Raymond’s discharge from the Navy, the couple settled in South Gate, Calif. where they began their family. Raymond was the loving father of three daughters—Susan Funk, Linda Lemon and Nancy Jones; the proud grandfather of Jennifer North, Michael Smith, Steven Graham, Brianna and Brandon Lemon, and Natalie Clemmer; and great-grandfather of Elizabeth, Abigail, and Emily Graham and Megan and Alyssa North. His kids and grandkids cherish the times they spent camping and fishing as a family. Ray enjoyed a long, successful career as a program manager at Datatape in Pasadena. After retirement, he took up golf and although he enjoyed it for many years, he joked that his game was akin to the seat covers on his golf court—Mickey Mouse! He was an accomplished wood worker and made many custom pieces for his home. Raymond was a kind, gentle man of few words with a quick, and sometimes corny, sense of humor.